Morning Motivation — Where are you dreaming to go? Where are you dreaming to go? Wherever you’re dreaming of going begin taking baby steps immediately to get there. Whether you want to visit Paris or Utah or Russia or Israel or Istanbul or Seattle it’s time to add planning to that dream. Will you need a passport? How much money do you need to make the trip? How long will it take you to save that amount? What time of year can you get vacation time? Where will you stay? What do you want to do when you get there? Figure it all out. Start putting five or ten or a hundred dollars away a month right now that is ear notched for this dream and this dream alone. Start researching. 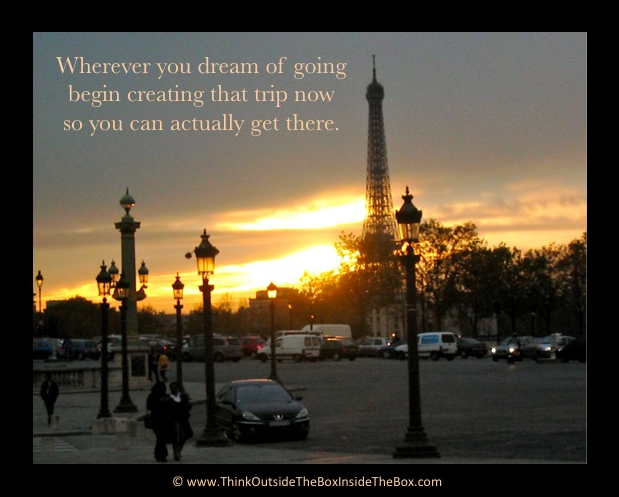 Start looking for creative ways to create this dream of going where you want to go. And get going.